Please welcome back to the blog, Kai from A Fiction State of Mind! You may remember her from last year's guest review of the Pride & Prejudice manga, which you can find here. This year, Kai is talking to us about her experience with something you rarely hear talked about -- Jane Austen's poetry! There always seems to be more to always seems to be more to discover about Jane Austen, and this year for Austen in August, Jane's poetry found me. It was an interesting experience. Jane's poetry reads very much like her novels. They show the occupations of her time and little glimpses of her private life. The are humorous, and often are snippets of the experiences of her life. The poems "When Stretched On One's Bed" and "I’ve A Pain In My Head" Reflect a lady in repose, be it from a headache or an escape to her bedroom for a much needed private moment. Initially there was some disappointment in my reading of these poems. I much enjoyed an audio version of some of them because the playfulness of the words shine through when read aloud. The disappointment stemmed from the need for them to be EPIC! They aren’t. But there is beauty and moments of beautiful connection in some of them. Like the poem she writes in remembrance of a dear friend that died on her birthday or the poem "This Little Bag" and ode to a device that hold needed items like a pin but more so is a symbol of the holder and the identify of a friend. it was interesting to step into Jane's poetic world, but I will always love stepping into her novels instead. That may busy the world as it goes! Of our Dance-loving friends at a Ball! What their flounces or hearts may befall. On the best that the Season affords! Or the Guests, be they Beggars or Lords. Can attract our attention or Ears! And touch nor our hopes nor our fears. We can feel on no subject besides. For our friends and our souls to provide. To her Doctor so dread. Whose name it was Newnham. LOL! Those made me laugh with their whimsicality. Anticipation of something to equal her novels would definitely leave one disappointed. Thanks for sharing about these, Kai. I haven't thought about her poetry in a while. I have never read any of Jane's poems before. Thank you for sharing them. Austen Eats: Ratafia Cakes Recipe from Beth! GIVEAWAY: Mistaking Her Character by Maria Grace! 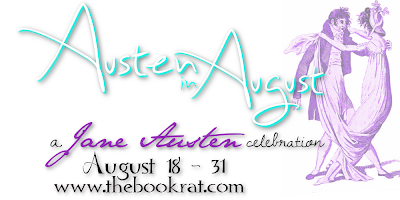 Austen in August 2015 Main Page!